I love breakfast foods and I am always am looking for different breakfast ideas. I love eggs, but sometimes I want something different and a little sweet. I have always loved cereal. When I was a kid, I liked raisin brain and frosted shredded wheat. As I got older, I switched to Chex, Cheerios, you know, the healthy stuff! NOT! I haven’t kept cereal in the house for about 5 years because there was always something in it that would make me eat the whole box in a few days even if it was unsweetened! Now it all makes sense! It was the grains! You don’t have to use the same nuts. Use what you like. I actually meant to use walnuts, but realized after it was in the oven, that I omitted them. Next time I will include walnuts, Brazil nuts and macadamia nuts. I have been making small batches of ice cream (recipe here) using only the egg yolk so this was a great way to use the egg whites I had been accumulating in the fridge. The whites serve as the binder and holds the spices on. (Check out THIS POST FILLED WITH 10 CEREAL RECIPES where I use water instead of egg white). Be sure to taste the granola before it goes into the oven. Adjust the sweetness to your liking. All nuts should be unsalted and raw is preferable (not roasted). Also when baking, keep the temperature low. Flax seeds have a low smoking point (225 degrees) so anything higher will oxidize their oils. 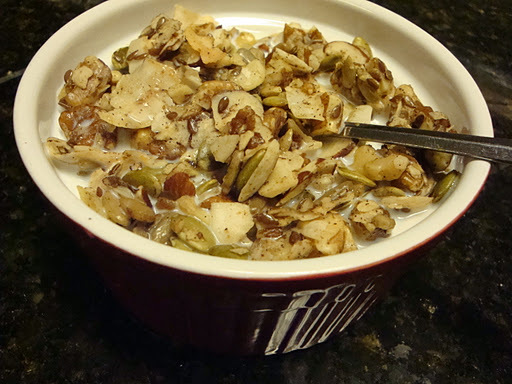 This grain-free granola/cereal is so simple and satisfying. 1/2 cup has about 5 net carbs compared to regular "healthy" granola has at least 30-40 grams and no one ever eats just 1/2 cup but this stuff will fill you up! Preheat oven to 225 degrees F. Line 2 jelly roll pans (cookie sheets) with parchment paper. Add stevia, pumpkin pie spice and vanilla to egg whites. Add nuts, seeds and coconut to egg white mixture and mix well. Spread granola over parchment lined pans. Cook for 40 minutes, stirring after 20 minutes (just set a timer) then turn off oven and leave for 1 hour or longer to continue to dehydrate. Remove and allow to cool before placing in an airtight container. Fold in with beaten egg whites, stevia and spices. Breakfast. For the kiddos, you could sprinkle in a few raisins or dried cranberries. « The Easiest Bread EVER! Love this recipe! I have 3 hungry kiddos to feed, they consume a LOT of breakfast cereal (same as an adult male). How much would an adult male eat of this cereal for breakfast? How long will it last in storage? Penny, glad you like the recipe! The first time I made it, I went to bed with 4 cups and I woke up with 1 cup so I think my husband really liked it! I would start off with perhaps a cup. It is going to be much more filling than regular cereal and require lots of chewing from the nuts. As far as how long it will last, so far I have had some a week but it's almost gone and taste as good as it did the first day I made it. I am going to make a a few batches today and I will hide some of it from my husband and keep an eye on if for a few weeks to see how it holds up! So Glad you liked it Deni! There are lots of variations that you can try and it really feels you up! This is also good when you have the munchies! 😉 Glad you are enjoying the recipes! @Vicki, sorry so long getting back to you! I have thought about a granola bar with it, perhaps using almond or peanut butter. That sounds yummy and filling! I love this cereal! I made it with a vegan egg substitute and it worked great! (1/3 cup flax seeds and 1 cup water blended until thick. Have you tried this? It almost even has the consistency of egg.) It came out delicious! I made this yesterday…and it's awesome. I did add a tad more stevia…but I believe even hubby loved it. It's a great change for morning cereal!!! Holy wow. This is so good! I made some last night and am seriously, thoroughly impressed. I, too, am (was) a bit of a cereal junkie before going sugar and grain free and I have been really missing that satisfying crunch! 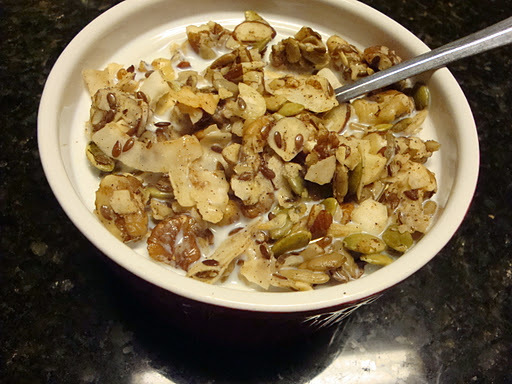 I had a bowl of this granola last night in milk (regular cereal style) and it hardly budged my blood glucose. Wonderful! I am eating some this morning for breakfast in some full-fat, unflavored greek yogurt with blueberries on top. Heaven! Thank you thank you thank you!!! Yummy! I am so glad you wrote that about flax seed smoking point… so GOOD to know! This is amazing! I bought both your cookbooks a couple weeks ago and this was the first one I tried and made 2 double batches, one as listed, and the other I omitted the cinnamon and added a couple Tbl of almond extract and a bit more Trader Joes organic powdered stevia and it was awesome. I also made your almond milk and dried the remaining almond pulp for flour later. Should we be storing this in the frige? Glad you enjoyed it Amy! The cereal doesn’t need to be stored in the fridge but the almond pulp does. It will spoil VERY quickly, even in the fridge. Just new to your website and signed up via email. Just purchased GF Toasted Unsweetened Coconut Flakes from a retailer for about $12 for a 9 oz bag. Way too expensive so I’m on a quest to make them myself. Google search took me to your website! Quick question… your recipe calls for “1 – 1/2 tsp” pumpkin pie spice (and also same measurement for vanilla extract) – do you mean 1 and a half tsp pumpkin pie spice? Or 1 tsp or 1/2 tsp? Thanks. Ann, 1-1/2 means 1 and 1/2 tsp. Different sites use different abbreviations so I know it can get confusing. I hope this helps! Yes, make your own… it’s so easy and always feel free to customize the spice amounts to your liking. Enjoy. Hello .. i love this recipe however i have only had this the non egg cooked verion. basically crushing up an leaving ib container an eating. Can this recipe be somehow converted to be made with a dehydrator??? That way I can leave it overnight or during work. A friend of mine shared this recipe with me and it is delicious. I already made the creamy spinach and it is awesome. And I made the cajun spice mix!! And I do live in louisiana!!! Love your stuff…are there nut substitions like walnuts cashews etc. 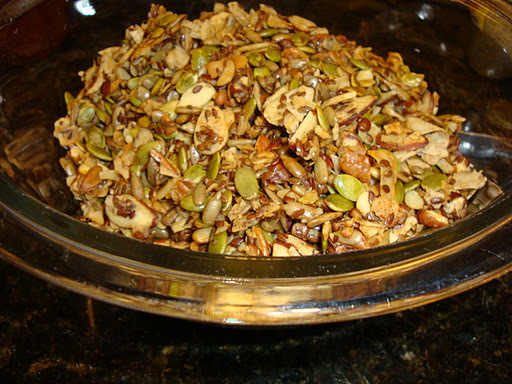 The ingredients call for 3 types of seeds and coconut flakes, but the directions only mention the nuts. Is there a step missing from the directions? Add them all to the bowl at the same time. I have this in the oven right now and it already smells amazing!! I used 1 1/2 tsp of xylitol. I have never used xylitol, but I tasted the mixture and it was perfect! I am planning to sprinkle this over frozen berries with cream for dessert! Thankyou! So glad you tried the recipe Jilian! And yes, it does smell amazing baking in the oven! Enjoy! I’m going to try this. Could this be prepared and stored for a week or more? Could honey be used in this recipe? Yes, I can be stored for a few weeks in an airtight container. As for honey, any sweetener will work. Since it is being “cooked” at such a low temperature you shouldn’t have to worry about it burning but keep an eye on it.